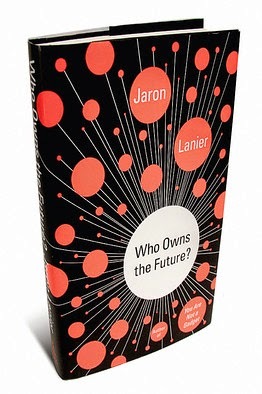 “Who Owns the Future?” attempts to answer the big question: where is this all going? By “this” I mean the big picture from an economic perspective. “Income disparity” is a popular meme. The growing concentration of wealth, complemented by the shrinking of the middle class—or, more accurately, the lowering of the standard of living of the middle class. Jaron Lanier does not promote the usual explanations that typically involve socio-political sloganeering of some sort. He explains the technological trend that is the real underlying cause, a change every bit as profound as the industrial revolution that transformed the world in the 19th and 20th centuries. According to Lanier, the concentration of wealth in market economies is the norm. Visualize a curve of exponential growth. The genius of democratic societies organically creates artificial barriers (Lanier calls them “levees”) to this inexorable movement of wealth from the many to the few. These are things like labor unions, the minimum wage, social security, Medicare, and tenure regimes for teachers. To Lanier, these are necessary adjustments to a system that otherwise would leave the mass of the population eventually impoverished. After identifying the technological causes leading to the erosion of the middle class and an ever-increasing concentration of wealth, Lanier proposes a solution. What we are presently undergoing is the equivalent of the industrial revolution: the inexorable growth of the digital world. The transferring of information into digital bits accessible to everyone with a computer or smartphone. The universal accessibility of information in the “cloud” via the internet is upending and outright destroying traditional business models and industries one by one, such as the music and travel industries. Businesses and industries presently entering the process of slow disintegration because of simpler and cheaper online alternatives include real estate (Zillow and Trulia), taxi service (Uber), education (MOOCs), book publishing and brick-and-mortar retailing (Amazon), as well as newspapers and magazines. In the digital world, wealth becomes concentrated about a relatively small locus of points in the immediate vicinity of the siren server. This aspect of the economic revolution we are undergoing has been noticed. It is present in the dire warnings constantly given about the need for better STEM (Science, Technology, Engineering & Math) education. The argument is that future jobs—those that supposedly will replace all the disappearing jobs in pre-digital world businesses that have been supplanted by free software apps on the Net—will require mathematical, science and (computer) engineering skills. That may be technically true; however—and it’s a big however—there will never be anywhere near the same quantity of jobs created in the digital world economies to balance those lost to the middle class. Furthermore, believing that we can train thousands of students who can’t add fractions to compete for jobs in hi-tech is, well, laughable. Lanier views this new concentration of income wealth as a consequence of the natural laws of economics responding to a technological revolution. Formerly middle class jobs will continue to be destroyed, and furthermore, what we have seen in the music industry, the newspaper industry, and brick-and-mortar book stores, is just the beginning. It’s going to get a lot worse. Lanier provides several future scenarios to argue his case. What is the logical conclusion of 3D-printing? Only the end of manufacturing as we know it, perhaps. Consumer products, including electronics and clothes, will be manufactured individually in the home. Plumbers will ‘print out’ a necessary pipe fitting, obviating the need not only for factories, but also for both distributors and plumbing supply stores! Besides the printer itself, the new commodity will be the software designs for the items “printed.” Once again, siren servers will emerge. A finite number of smart technicians, cranking out software designs. Lost: entire industries. Uncountable number of middle-class jobs. We have already seen how some industries have attempted to cope with the digital revolution. The music industry fought tooth, claw and lobbyist against Napsta and the inevitable digitizing of “music product.” Ultimately in vain. Ask your son/daughter how they get their music, if you don’t already know. But other industries appear completely oblivious to the writing on the wall. In the case of education, teachers, the soon-to-be-displaced workers, have actually cooperated with the siren servers to destroy their own professions! It is only a matter of time before private enterprise MOOCs muscle their way into the college accreditation business, and essentially nullify the value of a BA from PCU. It is only a matter of time before college students (and especially their parents) rebel at the notion of paying $50,000 to take online courses at a college, when the exact same value can be obtained with the same effort from a far cheaper alternative. Jaron Lanier is not some dystopian futurist; he is a bona fide computer scientist with Silicon Valley pedigree. He is part of the industry. He presently works for a siren server: Microsoft. Some of his predictions for future technological advancements driven by digitizing the world will surprise and shock you. But no matter how wild, they are all eminently plausible, and no doubt several startups will have as their genesis an idea first read in this book. If the book did no more than this, it would be a must-read for anyone curious about where “this” is all going. But Lanier does more—he offers a way out, a solution. Whenever Lanier explores the mechanism of a particular siren server, he exposes the free informational input necessary for its success. This is the information that we users give to the servers, sometimes unknowingly through cookies but just as often consciously by volunteering information. If you have ever written an online review of a product, a book or concert video, you have given away monetary value to a siren server. A good review generates Likes. And Likes generate sales. Text might be lifted directly out of a review for use by another review or the siren server itself. Credit scoring provides another example. A lender relies on a credit score. The credit score is derived from a scorecard that is only possible because of strategic credit information culled, without knowledge or consent, from thousands of people. The lender profits from the information in the credit score by using it to determine credit risk. The tens of thousands of consumers who contributed to that algorithm receive no remuneration for their contribution that made the scorecard possible. A dating site similarly relies on an algorithm. The algorithm in turn is constructed by analyzing data points. A particular couple who used the site and ended up marrying are considered a success. The parameters for the ‘perfect match’ algorithms are based in some part on this particular couple. They receive no remuneration. What we are talking about here is the source of the data. The data’s historical record. Lanier’s solution to the growing economic dislocations we are experiencing is to establish the provenance of all data, and then a payment (“nano-payments”) system of, in effect, royalties for any and all originators of data. So, in this scenario, any clever post in a FB timeline that gets Shared can earn a royalty. What Lanier is proposing, keeping the history of all data with the data itself, requires new internet protocols. But he insists it is not only doable, but actually was a choice in the original inception of the internet, one that could have been made but wasn’t. He also offers several fanciful schemes for how the payment scheme would actually work. Lanier’s analysis of the digital revolution and its impact on the middle class is compelling. He offers one solution. I have yet to hear others that make as much sense. I think his suggestions are worth considering.